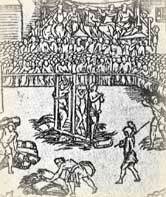 They decided that torture would loosen Anne's lips and so Henry VIII appointed Anthony Kingston to stretch her upon the rack until she revealed the names of others who opposed the king's brand of savage faith in power and influence.Anthony hesitated because she was a woman and was released from the task. Instead, it was given over to Thomas Wriothesley and Richard Rich. They did their best to execute the king's worst and Anne was viciously tortured in the tower of London. She refused to name any names but repeatedly insisted that she was willing to suffer for her Lord Jesus. This only infuriated the men because they claimed Jesus as their own even as they tortured and abused the woman--they missed the irony of this dark joke perhaps because they were so thoroughly invested in drastically broken values. She was stretched taut half-a-foot over the rack and her tendons, bones, ligaments, and muscles were broken and disfigured. When she still refused to do what they asked she was condemned to death and the condemnation was blessed by the same type of ministers who had erred so colossally before. They had to carry her to the stake where they burned her because the rack had left her unable to walk. When she arrived, they seated her on a post attached to the stake that would be her last earthly support. They covered her in gunpowder, set the stake ablaze, and foolishly prayed that God would have mercy on her soul while she prayed that God would forgive them for their sins against her. On that day in July of 1546, they made a martyr of Anne Askew and sinners of themselves.